Villa Malagarbo has fantastic scenic views over the surrounding countryside, Puig de Maria hillside and Tramuntana Mountains. The beautiful, traditional old town of Pollensa lies on the far side of the hill, only 10 minutes' drive away. The beach as well as further restaurants in the popular resort of Puerto Pollensa are a little further. This delightful 4 bedroom villa has a private pool and lawned garden, and includes WiFi and air conditioning/heating in all bedrooms. The views from Villa Malagarbo are just superb… The perfect setting for a relaxing holiday! Relaxing by the pool, you can enjoy the splendid views across the open countryside towards the mountains. There is plenty of space to sunbathe. The brick BBQ is to one side of the pool terrace and the exterior dining area is shaded from the sun. The utility room and exterior WC are also accessed from here. Villa Malagarbo is gated from the lane, with ample space on the driveway for your hire cars. The villa is semi-detached with the neighbouring house, but due to the position of the pool, retains its own privacy. The lounge is fairly spacious, with comfortable seating and a flat screen TV. The adjacent dining area has a table and chairs, as well as a seating area and ornamental wood burner. Follow the dining area to the end and you'll come to the fully equipped kitchen. Both the kitchen and dining area also have access to the pool terrace. On the first floor is a double bedroom with a small private balcony, and a twin bedroom, which share a separate bathroom. The second twin bedroom has an en suite shower room. The remaining double bedroom with en suite shower dominates the entire second floor. All 4 bedrooms also share that same magnificent mountain view. 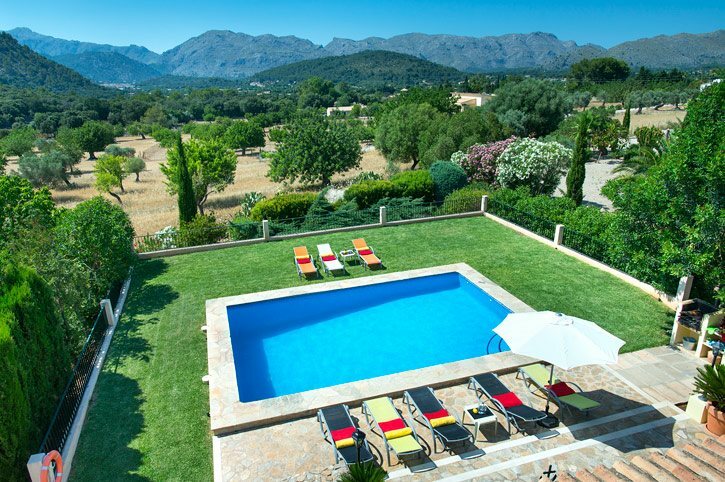 Surrounded by the beautiful Majorcan countryside, Villa Malagarbo is only a short drive from Pollensa (Pollenca) Old Town. A huge number of authentic Spanish restaurants are all at your fingertips, or, alternatively, you'll find a choice of more stylish restaurants along the seafront of Puerto Pollensa (Puerto Pollenca). The nearest beach can also be found here. The villa is also a great choice for keen golfers with the main course of the area right on your doorstep! A visit to Pollensa Old Town is not to be missed! Wandering through the cobbled streets and around the town square you'll come across a huge choice of traditional Spanish restaurants. If more contemporary surroundings are more your style, venture into Puerto Pollensa which has a number of fashionable restaurants along the seafront. There is also a choice of shops and supermarkets nearby where you can stock up on fresh food and prepare a meal on your own brick BBQ back at the villa. The nearest beach to Villa Malagarbo is at Puerto Pollensa. This long stretch of golden sand runs parallel to the famous Pine Walk which is lined with a huge selection of stylish restaurants. The more low key beaches of both Alcudia and Cala San Vicente are also within easy reach by car. The popular Hidropark is in the neighbouring resort of Alcudia, a little over 5 miles from Villa Malagarbo. No doubt the focal point of Pollensa is its historic old town, filled with authentic Spanish tapas restaurants. There is a large church in the square, and you can even scale the 365 steps up to the smaller Calvari church and admire the scenery. Other local highlights include the marinas of both Puerto Pollensa and Alcudia, as well as Alcudia Old Town - all easily reachable within a short drive. Villa Malagarbo is the ideal choice for golfers, with the popular Golf Pollensa course only 5 minutes' drive away. Anyone wanting something more active to do will find sailboat and windsurf hire as well as water skiing facilities at Puerto Pollensa. Villa Malagarbo is not available to book for season as it is sold out. Take a look here at the Majorca villas that are currently on sale. Beautiful villa, everything we needed. Spotlessly clean, with a change of bedding and towels half way through the week. We had a fabulous time and will certainly be back.